What Did Pilate Really Know About Jesus? This May Surprise you. As we leave Holy Week and look back upon the meaning of Easter, let’s not leave it in the past and forget it too quickly. To many in the world, Easter is simply another holiday. Many attend church on Easter but don’t fully comprehend the importance of Easter to the very foundation of our Christian faith. While a majority of Americans indicated some type of spiritual connection with Easter, the research also showed that a minority of adults directly linked Easter to the Christian faith’s belief in the resurrection of Christ. In all, 42% of Americans said that the meaning of Easter was the resurrection of Jesus or that it signifies Christ’s death and return to life. One out of every 50 adults (2%) said that they would describe Easter as the most important holiday of their faith. Now listen to Pilate’s reply. Pilate said, No, what I have written, I have written. Let’s think about this for a moment. Pilate is the Roman ruler who has appeased the Jews by allowing the killing of Jesus but yet he won’t change the sign on the cross? That is very telling. It seems that Pilate knew something the rest of us should clearly know…Jesus is the King of the Jews. Jesus is who He said He is. In Peter, chapter 2, we read this, He (Jesus) personally carried our sins in His body on the cross so that we can be dead to sin and live for what is right. By His wounds you are healed. If you don’t know Jesus, I invite you to meet Him today. By His wounds your sins are forgiven and by His wounds your broken life can be healed. The crucifixion was only the beginning of the story. The story ends with a miraculous resurrection…a God who lives. A God not impacted by the power of the grave. If the crucifixion were the end of the story there would be nothing to celebrate…there would be no point to Easter. But we do have a reason to celebrate Easter and this God can be the leader of your life if you simply allow Him to lead. So now the choice is yours. Try to live on your own with no hope for eternity or live with the King who will bring you joy that you cannot imagine. I think Pilate knew who Jesus was and I suspect you do to. Change your life and live for the King today. As we think this week about Easter and what Christ accomplished for us, I want to take you back for a moment to the day Jesus was crucified. As you may recall from scripture, prior to the crucifixion, Jesus suffered a terrible beating by the Romans. The instrument used to deliver this form of punishment was like the old British cat o’ nine tails, except that the whip was not designed merely to bruise or leave welts on the victim. 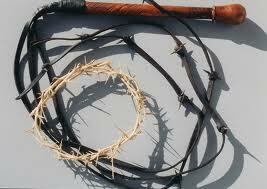 The whips used had at least three strands, each perhaps as much as three feet long, and the strands were weighted with lead balls or pieces of bone. This instrument was designed to lacerate. The weighed strands struck the skin so violently that it broke open. The church historian Eusebius of Caesarea recounts with vivid, horrible detail a scene of scourging. He says, “For they say that the bystanders were struck with amazement when they saw them lacerated with scourges even to the innermost veins and arteries, so that the hidden inward parts of the body, both their bowels and their members, were exposed to view” (Ecclesiastical History, Book 4, chap. 15). As we think about the pain that Jesus experienced for us, I am reminded of the words of a song that say, “your name is written in His wounds.” You see, Christ went through all this pain for each of us. With each hit of the scourge, our names were being written in His wounds. He took the punishment for our sins because He loves us. As you think about the beauty of Easter, don’t forget about the pain that was necessary for the beauty of the resurrection. As you go through your life, don’t forget that sometimes there is pain before the beauty comes. Jesus loves us deeply and each of our names was written in His wounds. Never forget Christ’s love for us and the beauty of eternal life that came from His pain and ultimate love for each of us.